The Chesapeake Bay Governor’s School hosted its 14th Annual Science Symposium at Virginia Commonwealth University on Saturday, March 11th. During the morning sessions seventy-seven seniors presented their independent research projects which were judged by visiting members of the scientific community from Virginia Commonwealth University, The College of William and Mary, Virginia Institute of Marine Science, and Rappahannock Community College, among others. During the afternoon session the keynote address, “Research at the Bottom of our Planet: The Changing Antarctic Ecosystem” was given by Dr. Deborah Steinberg, a professor at The College of William and Mary’s Virginia Institute of Marine Science. For more information, including a list of awards, please see the press release. Chesapeake Bay Governor’s School‐Warsaw Campus sent two teams to compete in the 20th Annual Blue Crab Bowl, held February 18 at the Virginia Institute of Marine Science in Gloucester Point. The day‐long academic tournament is the Virginia regional contest for the National Ocean Science Bowl (NOSB©). Fifteen teams came from across of the Commonwealth, from Manassas to Virginia Beach, Warrenton in the west to Exmore, on the Eastern Shore. The nearly 80 students spent the day in heated tournament competition focused on the marine sciences. Chesapeake Bay Governor’s School participated in the Grafton Fall Scholastic chess tournament at Grafton High School in Yorktown on September 24th, 2016. CBGS’s four students had a clean sweep in the K12 unrated section taking 1st through 4th place and the 1st place team trophy. Northumberland High School sophomore Nathan Parker placed first after winning all of his games, Essex sophomore Gabriel Carlton placed 2nd, Colonial Beach senior Tori Nutt placed 3rd, and Westmoreland senior Ethan MacNamara placed 4th. The tournament was hosted by the Virginia Scholastic Chess Association (VSCA) which holds rated and unrated tournaments monthly around the state. VSCA tournaments have brackets for all ages and skill levels. CBGS plans to participate in several rated tournaments in the following months. Students, adults, and schools in surrounding areas interested in learning more about chess or participating in tournaments are welcome to contact Mr. Dorsey at the Chesapeake Bay Governor’s School for more information (gdorsey@cbgs.k12.va.us) or visit the Va. Scholastic Chess site at vschess.org. Thirty-two Chesapeake Bay Governor’s School seniors from Bowling Green, Glenns, and Warsaw campuses attended the 2016 Virginia Junior Academy of Sciences Research Symposium May 17-19th at the University of Mary Washington in Fredericksburg, VA. At the symposium students presented the results of their 2-year independent research project. I wanted to let you know that there is information circulating statewide about possible increased funding for all of Virginia’s governor’s schools. Governor’s school directors have met and most certainly hope for this line item to increase, as outdated funding for our schools limits what we are able to do, at times. Chesapeake Bay Governor’s School (CBGS) students participated in the Richmond Grand Prix chess tournament in Richmond City on April 2, 2016. Students from CBGS came out on top in the high school section with Cristian Diaz (Essex HS) placing first and John Richardson (Lancaster HS) taking second. The tournament was hosted by the recently founded Richmond Chess Initiative (RCI) to bring accessible chess events and clubs to locations on Richmond area bus lines. The founder, Mike Callaham, a Class A rated player and Virginia Scholastic Chess Association secretary, has been working diligently to expand chess opportunities for Virginia students; the Richmond initiative is only his most recent effort. RCI programs are open to anyone interested. Students and adults in surrounding areas interested in learning more about chess or participating in tournaments are welcome to contact Mr. Dorsey at the Chesapeake Bay Governor’s School for more information (gdorsey@cbgs.k12.va.us). 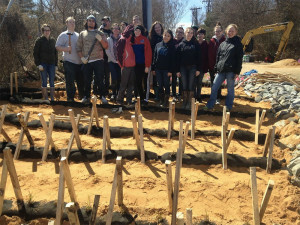 On March 18th, students from the Bowling Green campus of CBGS installed a living shoreline at Port Royal. This was part of a collaboration with Friends of the Rappahannock that restored a shoreline by planting native wetland plants at a public boat launch. The Chesapeake Bay Governor’s School hosted its 12th Annual Science Symposium at Virginia Commonwealth University on Saturday, March 14th. During the morning sessions eighty-one seniors presented their independent research projects which were judged by visiting members of the scientific community from Virginia Commonwealth University, The College of William and Mary, Virginia Institute of Marine Science, the EPA, and the Office of Naval Research, among others. During the afternoon session the Keynote Address, “How Will You Measure Your Life?” was given by Ms. Leah Coates, a 2010 graduate of CBGS and 2014 graduate of UVA, who is an associate consultant at Bain and Company, Boston, Massachusetts. Ms. Coates challenged the students to apply the principles of the scientific method to their lives beyond the scientific field. An awards ceremony followed with ribbons being presented to those seniors whose presentations were judged to be exemplary. Chesapeake Bay Governor’s School (CBGS) and Essex High School students participated in the Second Annual Keswick Hall Chess Open in Albemarle County on January 31, 2015. The best students from the emerging chess clubs at CBGS Glenns, CBGS Warsaw, and Essex High Schools competed in their first travel event against some of the best scholastic players in the Charlottesville region. The tournament was hosted by the Charlottesville based non-profit Playing ACES Chess which has made efforts towards hosting clubs in every public school in the Albemarle/Charlottesville region. CBGS chess coach Greg Dorsey, a Middlesex County native, played a key role in the creation of ACES Chess and hopes to use this background to build a chess presence in the Middle Peninsula and Northern Neck regions. Essex High School student Charlie Bussler placed 4th in the competition and CBGS and Essex High School student Christian Diaz placed runner up. CBGS Glenns and Gloucester High School student James Thomas also participated. All Middle Peninsula and Northern Neck residents with interest in joining or creating chess clubs in the area should contact Mr. Dorsey at the Chesapeake Bay Governor’s School (gdorsey@cbgs.k12.va.us). Chesapeake Bay Governor’s School (CBGS) hosted the first Middle Peninsula and Northern Neck Regional Chess Tournament at Tappahannock’s Old Beale Church on January 24th, 2015. Students from surrounding districts participated in the free, unrated tournament, which was organized to help spark chess interest in area schools. To prepare their students for the event, area high schools formed new chess teams and trained in the weeks approaching the event. Tournament director Greg Dorsey (CBGS Faculty), a Middlesex County native, was active with the University of Virginia Chess Club and played a key role in the creation of the new Charlottesville based 501(c)3 non-profit Playing ACES Chess. Playing ACES provides weekly chess clubs to over 15 public schools and community venues each semester. Mr. Dorsey hopes to use this background and experience to build a chess presence in the Middle Peninsula and Northern Neck regions. Faculty at Essex and Lancaster High Schools are currently working with Mr. Dorsey to create sustainable chess clubs at their high schools with the potential to have competitive varsity travel teams. The very strong chess presence in Northern Virginia and Hampton Roads and an emerging chess presence in Richmond makes this region a perfect central point to compete in chess events over the coming years. All Middle Peninsula and Northern Neck residents with interest in joining or creating chess clubs in the area should contact Mr. Dorsey at the Chesapeake Bay Governor’s School (gdorsey@cbgs.k12.va.us). Chesapeake Bay Governor’s School (CBGS) students have installed a native plant garden at the CBGS – Bowling Green campus thanks to the Virginia Conservation Assistance Program (VCAP) grant awarded from the Caroline/ Hanover Soil and Water Conservation District. Students used course content from their Foundations of Science and Marine & Environmental Science classes to decide what type of garden to plant and the location of the garden. The native plant garden replaced turf that required additional maintenance with plants that are native to the area. Native plants attract pollinators and improve groundwater infiltration. As more donations become available, Chesapeake Bay Governor’s School students hopes to install more native plants and cisterns. Cisterns will capture rainwater from the roof of the building to water the plants, again reducing the maintenance of the area. Additional donations from Brent’s Native Plantings, Fredericksburg, VA; Chenault Lumber, Ruther Glen, VA; and G & G Ace Hardware, Milford, VA made this project possible. The students and staff at CBGS would like to thank all who helped make this community service project possible. Chesapeake Bay Governor’s School hosted its Eleventh Annual Science Symposium at Virginia Commonwealth University Saturday, March 15th. During the morning sessions eighty-seven seniors presentated their independent research projects which were judged by visiting members of the scientific community from Virginia Commonwealth University, The College of William and Mary, Virginia Institute of Marine Science, the EPA, and the Office of Naval Research. The afternoon session was a panel discussion on the use of animal subjects in scientific research with Dr. Daniel McGarvey, Center for Environmental Studies, Virginia Commonwealth University, and Dr. Ruth Williams, Gloucester-Mathews Humane Society, Animal Welfare League of the Northern Neck. Ribbons were awarded to those seniors whose presentations were judged to be exemplary. The Sixth Annual Chemistry Lab Practical Dinner was held on Sun. Jan. 5th and Sat. Jan 12 at Northumberland House, home of Mr. Benjamin and Dr. Sandra Ward. The Lab Practical was part of the Chemistry grade for the 33 chemistry students at the Chesapeake Bay Governor’s School Warsaw campus. Judges were: Mr. George Beckett; Mrs. Jan Beckett; Mrs. Charlotte Hunley; Mr. E.A deBordenave; Mrs. Constance deBordenave; Dr. Dianne Pollard, director of CBGS; Mr. Benjamin Ward; and Dr. Sandra Ward, Chemistry instructor at CBGS. Many chemical reactions occur in everyday life, and cooking is a practical experience in chemistry at work. The Chemistry Dinner categories included: Appetizer, Soup, Bread, Beverage, Entrée, Side dishes, and Dessert. Each student prepares one item. The evaluation includes: name of item, category, written recipe (ingredients and instructions). The report of the item must contain 10 ingredients stating their chemical composition, 10 techniques employed, and 10 chemical reactions that occurred. The item prepared for the dinner is judged on presentation (appearance), and taste for an additional 10 points. Students enjoyed a formal dinner of each of the items prepared. Forty-seven educators and students from around the world have been selected from a competitive pool of applicants by the Ocean Exploration Trust (OET) to participate at sea during their 2013 Nautilus Exploration Program. The selected educators and students hail from schools, universities, and science centers in twenty-one states and five countries. They will join the Nautilus Corps of Exploration during ocean expeditions from June through November in the Gulf of Mexico, Caribbean Sea, and Mediterranean Sea. Bethany Smith from Chesapeake Bay Governor’s School (CBGS) – Warsaw Campus has been selected as a 2013 Educator at Sea and will sail with the Nautilus Exploration Program during their 2013 expedition season. Bethany, who teaches Marine & Environmental Science at CBGS, will join the expedition in the Gulf of Mexico in mid-July. “I am incredibly excited to join the Corps of Exploration this summer! Our oceans are some of the most unexplored places on our planet, and being able to join Dr. Robert Ballard and this incredible group of scientists, engineers, students and educators aboard E/V Nautilus is a once in a lifetime experience. Getting to share this experience with my students, the community, and the world is equally exciting,” said Smith. The 2013 educator and student selectees will embark on several expeditions aboard Dr. Robert Ballard’s ship of exploration, E/V Nautilus, and other research vessels off the coast of the United States and Puerto Rico, as well as Montserrat, Cayman Islands, Bahamas, Grenada, Trinidad & Tobago, and Turkey. As members of the Corps of Exploration, educators and students will stand watch alongside scientists and engineers, as well as participate in live interactions with shore-based audiences via Exploration Now. When launched in June, Exploration Now will be a 24-hour online portal bringing expeditions from the field to future explorers on shore via telepresence technology. The Educator At Sea Science Communication Fellowship Program will be bringing out 16 new educators and 4 returning lead educators, including educators from Northern Ireland and Venezuela. Educator at Sea positions entail 2-4 week periods working aboard E/V Nautilus and other vessels as communicators of the expedition. An equally important aspect of the program is bringing the expedition back home to local student populations and communities after they have returned home. The Educator at Sea Program is sponsored in part by Bechtel. The Science and Engineering Internship Program will be bringing out 15 interns, including students from Australia and Canada. The internship program aims to train undergraduate and graduate students studying ocean science, engineering and film in the at-sea environment. Intern positions entail 2-5 week periods working aboard E/V Nautilus and other vessels as Data Loggers, ROV Pilots, or Video Engineers. The Honors Research Program (HRP) will be bringing out 12 students from across the United States. The HRP Program invites junior and senior high school students to participate in a seven-week summer research and exploration program. Students work with scientists at the University of Rhode Island (URI) Graduate School of Oceanography (GSO) and are also invited to join our Corps of Exploration aboard Nautilus and other vessels. The Nautilus Exploration Program was founded in 2008 by Dr. Robert Ballard. Our international exploration program centers on scientific exploration of the seafloor launched from aboard the Exploration Vessel Nautilus, a 64-meter research vessel currently based in the Caribbean Sea, and additional research vessels. In addition to conducting pure scientific research, the Nautilus Exploration Program offers telepresence to explorers on shore via live video, audio and data feeds from our ships. The Program also includes an education component that brings educators and students on ocean expeditions. The 2013 Nautilus Exploration Program sponsors are the National Oceanic and Atmospheric Administration, Bechtel, Sea Research Foundation, Office of Naval Research, National Geographic Society, University of Rhode Island, and additional private donors. Chesapeake Bay Governor’s School – Warsaw Campus seniors Megan Daiger (Washington & Lee), Meghan Frere (Lancaster), Andi Mayer (Lancaster), Megan Parker (Rappahannock), Katie Parr (Essex), and Emmanuel Valdez (Washington & Lee) presented the results of their two-year independent research projects to residents and staff at Rappahannock Westminster-Canterbury (RW-C) in Irvington on Monday, April 29, 2013. The students presented projects which investigated topics including beaver dams, local wetlands, marine life, shoreline stabilization, and aquaponics. These students will all present their research again in May at the Virginia Junior Academy of Sciences (VJAS) meeting at Virginia Tech. Following the program, former Virginia Governor A. Linwood Holton, Jr. addressed the crowd. Mr. Holton, a resident at RW-C, is the 61st Governor of Virginia, and during his term, the Virginia Governor’s School program was created. Governor Holton spoke about how the Virginia Governor’s School program came into existence and how pleased he was to see it continue to flourish. Today, nineteen Virginia Governor’s Schools serve advanced students throughout the Commonwealth. Chesapeake Bay Governor’s School – Warsaw Campus (CBGS) sophomore Mercedes Fortune, a student at Essex High School, was selected as a winner in the 2013 J-aRt contest. This national contest, sponsored by the Consortium for Ocean Leadership’s Deep Earth Academy, invited students ages 5-25 to submit styrofoam sculptures for judging in multiple science categories. Mercedes created her abstract art sculpture which somewhat resembles the tilted and jumbled layers of Earth’s crust, as a project for science teacher Bethany Smith’s Foundations of Science class. Mercedes will now mail her sculpture to the scientific ocean drilling ship JOIDES Resolution where it will be sent to the deep sea during a scientific drilling research expedition. Because of the intense pressure in the deep sea, Mercedes’ sculpture will shrink dramatically! CBGS students will get to watch Mercedes’ sculpture descend into the deep via a live ship-to-shore interaction with the JOIDES Resolution in May. Chesapeake Bay Governor’s School hosted its Tenth Annual Science Symposium at Virginia Commonwealth University Saturday, March 9th. During the morning sessions eighty-four seniors gave PowerPoint presentations of their independent research projects which were judged by visiting members of the scientific community from Virginia Commonwealth University, The College of William and Mary, Virginia Institute of Marine Science, and Hampton University. The Keynote Speaker for the afternoon session was Dr. Deidra Gibson, Assistant Professor, Interim Chair, Department of Marine and Environmental Sciences at Hampton University, who addressed the assembled students, faculty, and parents on “What is Your Science Footprint?” Certificates of Recognition and ribbons were awarded to those seniors whose presentations were judged to be exemplary. The ocean’s microscopic drifters served as inspiration for a variety of artwork created by Mrs. Smith’s 11th grade Marine & Environmental Science I classes. The word plankton is derived from the Greek work planktos meaning wanderer or drifter. Characteristically microscopic, and unable to move against a flowing current, planktonic organisms are a vital link in both freshwater and marine food webs. Phytoplankton (plant plankton) trap the sun’s energy, jumpstarting the food web, and zooplankton (animal plankton) graze on the phytoplankton, similar to how herbivores graze the world’s grasslands. Both phyto- and zooplankton provide food for commercially valuable Chesapeake Bay seafood species such as blue crabs, oysters, menhaden, striped bass and many more. Students were tasked with creating artwork inspired by these aquatic drifters. On Wednesday, February 27th, the CBGS classroom was transformed into an art gallery as students displayed and presented their work. After researching the different types, forms, and shapes of plankton, students used a multitude of art mediums including pencil drawings, paintings, sculpture, quilling, photography, food, fashion design, and jewelry to represent their chosen source of inspiration. Planktonic organisms that inspired artwork included diatoms, dinoflagellates, radiolarians, copepods, jellyfish, ctenophores, and even the bioluminescence produced by some planktonic organisms. Some pieces of artwork were very literal translations of the plankton that inspired them, while others were much more abstract. Several students even used their personal experiences with jellyfish and bioluminescence to inspire them. The final products were a result of analytical research, creativity, design, and presentation, thus allowing the students to exhibit higher level thinking skills and problem solving, and see just how connected science and art can be. For several CBGS students and faculty members, an early morning beach run in Nags Head, NC turned into more than a chance to stretch their legs. Instead of seaweed and other flotsam washed up on the beach, they found a deceased 5 meter (a little over 15 ft) long female Beaked Whale (Mesoplodon mirus – True’s Beaked Whale). CBGS biology instructor J. Daniel Maxey reported the stranding to the local authorities, explaining to the students the strict laws protecting marine mammals (dead or alive). The group took some rough length measurements along with pictures and video that will be used in future lessons at CBGS. While the sighting of this rare marine mammal stranding is exciting alone, this experience was about to provide all CBGS students in the field a unique educational opportunity. At breakfast the next morning, CBGS instructors were fortunate enough to recognize the University of North Carolina at Wilmington marine mammal stranding response team by a graphic on one of the members’ T-shirts. Pouncing on what was to be an extraordinary educational opportunity, the CBGS faculty and students moved to the beach to witness the scientific data collection from this rare whale stranding. “While we had originally planned other data collection activities for the morning, the opportunity for our students to witness the necropsy (scientific autopsy) of a marine mammal was something that we faculty members couldn’t pass up,” CBGS Marine and Environmental Science instructor Bethany Smith noted. Immersing students in close-up, unique opportunities to see science in action as well as interactions with scientific experts is a central part of the CBGS mission. The students watched in awe, making detailed notes and drawings as the scientists processed the carcass, taking body measurements and blubber and organ samples. Early on, the stranding team determined the beaked whale was pregnant, and students were able to view the fetal beaked whale before it was carefully wrapped up and packed away for future studies. “You are part of a small, small percentage of people who have ever witnessed the stranding of a True’s Beaked Whale,” CBGS Marine & Environmental Science instructor Jim Beam told the students afterward. CBGS student and Rappahannock High School Senior Megan Knight came away from the experience with affirmation of her future plans. “I’m sure now that I want to be a doctor. Seeing the necropsy made me confident I can handle medical school.” For teachers and students, the educational experience didn’t end when they walked off the beach. CBGS faculty are in contact with Dr. William McLellan, the marine mammal stranding coordinator for the state of North Carolina, and Dr. Ann Pabst of the marine mammal stranding program at UNC-W, and have already received data and additional information about this stranding. CBGS faculty hope to continue this partnership, allowing the students to see how data collected from this whale can advance scientific knowledge of a very cryptic and poorly understood species. For the students and instructors on the trip, this is one whale of a tale that will be told for years to come!